Fujiwara no Iyozane (藤原　伊代真, Fujiwara no Iyozane) is the true throne successor to the Capital City, but after being killed by Ooama no Ake no Mitori and later brought back to life by an unknown source, they fell from grace and now work as a humble boater. Currently, they are working with Taira no Fumikado with their goals to become emperor, in the hopes that they will become an influential person again. Iyozane was the first successor to the throne for the emperor in the Capital City. They were close with their relative Fujiwara no Mitori and their friend Kunimitsu Ooya. However, they were unhappy with their "gilded cage" lifestyle, so Mitori decided to mercy-kill Iyozane by poisoning. 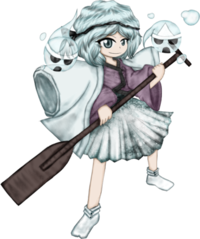 Mitori disposed the body later, but after an unknown source revived them, Iyozane decided to start over as a normal person by doing menial jobs, such as carrying baggage and letters and working as a boater. When Taira no Fumikado escaped from the Capital City in order to escape from assassins, they decided to cross the Gloomy Straits when they met the boater Iyozane. The latter tried to break the ice and make conversation by telling about their own story, which concluded with Iyozane playing the flute for Fumikado. After that, they learned each other's names and realized that they belonged to enemy families, but at that point it didn't matter any more. Fumikado explained that soon, a big hole will open in the internal side of the Mugenri Barrier, and lots of spirits will enter the barrier. They decided to work together, with Fumikado giving Iyozane a replica of a youkai tool, the "Saeda" flute once carried by Taira no Atsumori, so Iyozane could be able to control and guide the spirits to them. Laid-back, straightforward and gentle, Iyozane is never comfortable with whatever they are doing. Though they're a good person, Iyozane is also bad at lying and keeping secrets (except for the truth about them being successor to the throne). Perhaps due to being part of the royal family once, Iyozane is ambitious and wants to become an influential person again, but with the freedom to do what they want this time. After their faked death and fall from grace, Iyozane wished to become a pirate, but upon meeting Fumikado, they wanted to become their chief advisor. Their ability to manipulate waves is convenient when they want to move their boat around the straits. No one knows the true extent of this power, but they have been seen to use it to shoot water, create waterfalls and even summoning colossal tidal waves. 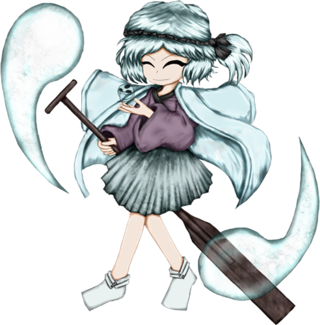 Apparently Iyozane is good at wind instruments, so Fumikado gave them the flute called "Saeda", which creates music that attracts spirits. It's revealed that the flute can only be used by those who have crossed over life and death. 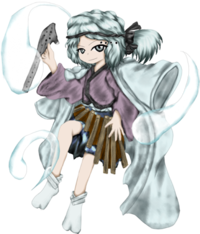 Since Iyozane was killed in an assassination attempt and brought back to life, they have affinity with spirits. Iyozane is likely based on Fujiwara no Sumitomo, a famous pirate in the Heian era. It's unknown if their surname is based on Fujiwara no Mokou's as if there is supposed to be some kind of relation, or if it's just a coincidence. Their character may be an homage to Mononobe no Futo , because both have boats, their clans had a grudge with another royal family and is the servant of a character from a royal lineage who cheated death. Their full name is Fujiwara no Iyozane (藤原　伊代真). Their last name Fujiwara (藤原, "Wisteria field") is an actual and a common surname used in Japan - it should be noted that while this is one of the evidence which proves the political influence of the Fujiwara Clan, there are some Fujiwaras that aren't related to the Fujiwara Clan. The characters for Iyozane (伊代真) literally mean "True generation". The hiragana character no (の) used here indicates a "belonging", thus the English equivalent of their name would be "Iyozane of the Fujiwara". In ancient Japan times, it was common for aristocrats with a clan's name to have no between their clan's name and first name. Iyozane has short silver-blue hair and eyes of the same color. They wear a brown headband and Japanese clothing. They are also often surrounded by spirits. In Brilliant Pagoda or Haze Castle, the spirits around them appear to resemble the Bakebake . Fumikado convinces Iyozane to work for their resurrection ceremony, in exchange that they will become their chief advisor. Filled with ambition, Iyozane agrees and with their boat, rides towards the Gloomy Straits playing their flute as it attracts the spirits. The flow of spirits upsets the heroes, who then confront Iyozane. Yabusame and Tsubakura encounter Iyozane and accuse them of controlling the spirits and provoking a long winter, much to the boater's confusion. After being coarced by Tsubakura, Iyozane tries to explain their own motives, but is interrupted by Yabusame, who wants to play with the flute. After being defeated and getting a hold of the flute, Iyozane says that it doesn't matter, since their part in Fumikado's plans is done. Iyozane encounters Sukune, who are revealed to be good friends from the Capital City. When the haniwa asks why they are using a flute to herd the spirits, the boater answers that someone important promised that if they cooperated, they will make Iyozane a chief advisor. Yaorochi accuses them of being the mastermind and attacks. After being defeated, Iyozane reveals that they are serving Fumikado and guides them to the location. Iyozane encounters Kuroji Shitodo and Adagumo no Saragimaru, who proceed to interrogate them about the amount of spirits and ask why is Iyozane gathering them. The boater reveals Fumikado's plans, saying that they only agreed to cooperate because Fumikado promised them something big in return. Believing it to be money, Kuroji demands it, but Iyozane says that they are penniless currently but can give them postpay later. Angry, Kuroji and Saragimaru fight them. After Iyozane is defeated, they say that they will remember it. When the team reaches Fumikado's resurrection ceremony, Iyozane tries to stop them, not out of concern for Fumikado, but because they want to be their chief advisor if their plan succeeds. Despite their fall from grace, Fumikado plans to take over Mugenri. Together with Iyozane and Tsugumi, they go to resolve the incident. Iyozane is now doubting about being allied with someone who is now a rogue fugitive, but helps them nonetheless. Iyozane ferried Fumikado when they were escaping assassins. Fumikado asked Iyozane for their assistance and gave a tool to guide the spirits to Fumikado. Iyozane believed that they would become Fumikado's chief advisor and helped. They now question their relationship with Fumikado, but tries to help them anyway. After the events of Brilliant Pagoda or Haze Castle, Iyozane decides to stay at Fumikado's side. They are Iyozane's partner whom they sometimes bickers with. They both work together to try and fulfill Fumikado's plans. Both are acquaintances from the Capital City and despite defeating Fumikado and ruining Iyozane's chances to become a chief advisor, they're still on good terms. Iyozane and Kunimitsu used to be friends in their youth, but seem to have distanced after Iyozane left the Capital City to become a boater. It doesn't help that Iyozane is allied to Fumikado, who is now a rogue fugitive from the Capital City. Kunimitsu didn't recognize Iyozane at first, until the boater called them by the pet name of Micchan (みっちゃん, Micchan), which only Iyozane uses. Mitori and Iyozane were both from the Fujiwara clan and were close friends in their youth. Until Mitori learned of their true parentage and killed the emperor. Iyozane was also killed by Mitori that day, but they have no ill will toward each other and Mitori is delighted to see that Iyozane survived from their assassination attempt. Mitori also apologized for killing Iyozane's father, but insisted it was something that needed to be done. Sanra and Iyozane were both members from the Fujiwara clan. it's unknown what was their relationship in the past, but Sanra calls them "Iyo-sama". At Brilliant Pagoda or Haze Castle, Sanra didn't recognize Iyozane (since like most people from the capital, they believed Iyozane was dead) and was shocked upon finding that Iyozane was alive all along. Illustration of Iyozane with Fumikado and Tsugumi for Len'en Project's 2nd anniversary. ↑ Kyougoku is a town in Hokkaido. This page was last edited on 13 November 2018, at 09:51.